I’ve been making bread for a long time, mainly using a simple recipe that I know by heart. It’s very straightforward – a kilo of flour, 600ml of water, 20g of salt and 10g of yeast. It makes an unpretentious, dependable loaf, but has the flexibility to take on new forms. Substituting half the flour for wholemeal, or mixing it up with a hundred grammes of rye or a couple of handfuls of oats makes the finished loaf very different, but borne of the same simple recipe of a kilo of flour and 600ml of water. I’ve strayed all over the place, of course. I’ve bought book after book about baking bread, and tried dozens of different methods. High hydration loaves (don’t bother), sourdough, milk loaves, baguettes, all of them. All have their place. All are good, but still the simple recipe remains a backstop in my kitchen. A kilo of flour and 600ml of water. Some things are best left as they are. Some things don’t need to be messed with, don’t need to be improved, and this is one of those things. It isn’t fancy, it isn’t artisanal, but it is good and honest. I’ve done one thing, made one tiny change to this decades old routine, and it’s worked. It’s made things better. I habitually make bread on a Sunday afternoon, late afternoon, maybe at about four or five PM. The challenge is to get everything out of the oven by half ten at the latest, allowing enough time for a good, long, slow rise so that the flavour of the dough has time to develop as the yeast works its magic. It can be a push, and there are times when I wait and wait for a batch of loaves to cook, desperate to get to bed ready for Monday. But there’s another way to get that long, slow fermentation. It gives better results with less of the hassle. Using a pre-ferment, or a sponge, solves these problems. The night before, or even early on the same morning I want to bake, I mix together half of the flour with all the water and all the yeast to make a very wet and loose slurry. The loose dough sits and gently bubbles away for many hours, slowly fermenting and developing flavour. When it comes time to bake, I add the other half of the flour, the salt, and any other ingredients that are going into that particular batch before mixing it together into a pliable dough and kneading it out. This shortens the active baking time considerably, because the new dough made with the old pre-ferment only needs one bulk rise instead of two, so the process can be up to a couple of hours shorter. The first stage, overnight, counts as one bulk rise, and it’s then that the dough develops its flavour. 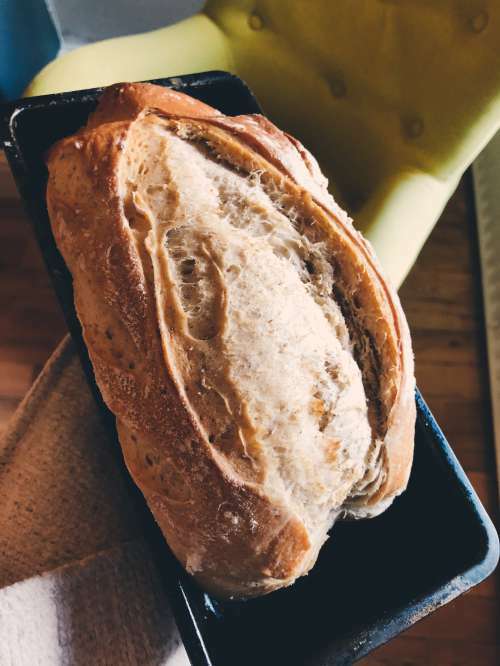 This method isn’t sourdough, although it shares some of the characteristics, and a slug of sourdough starter in the initial sponge along with the yeast works wonders. A sourdough is raised with only wild yeast, but it shares the same low, slow fermentation period to wake the yeast and bulk up the dough. The end result of a dough leavened with a pre-ferment is excellent. The dough is easier to handle, more supple, and has an improved spring in the oven, exploding out of the tin or off of the baking sheet. The finished bread has an even crumb and a complex and deep taste, with a mild tang of sourness to it. It’s well worth the effort, but it needs organisation. It’s also best to make this type of loaf in bulk. I bake this in batches using 4kg of flour, and multiply everything up accordingly. Kneading is an effort, of course, but it’s worth it. Another trick – use a homebrewers’ fermentation bin to mix, rest and rise the dough. They’re cheap, enormous, come with a good lid and you can see through the sides, so it’s easy to keep track of how well your dough is rising. Sometimes, little changes make a whole world of difference. This is brilliant. I’m going to try this process -it literally fits my schedule ! Quick question: how long to do you suggest letting the dough rest on the 2nd proof ? Same amount of time as normal, so long enough for it to double in size. Probably between an hour and an hour and a half, maybe a bit more.